Today (about 5 minutes ago), Nature ran an online Q&A session on the subject of animal research to fit in with its latest special editorial on the topic. It was interesting to see that the UK, where animal rights activism is at an all-time low, considers it a bigger threat than the US. 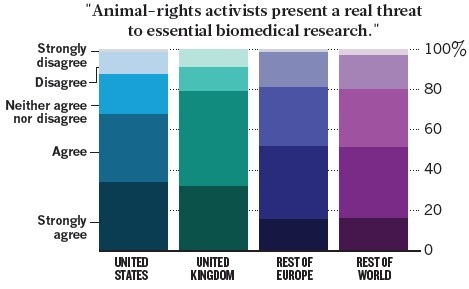 Perhaps this is because the UK has seen the damage that animal rights activism can do to biomedical research. Also of note was that almost no one in the rest of Europe disagreed with the premise, perhaps reflecting the generally high levels of extremism which have occurred across the continent. In this electronic age, remaining silent is not an option for scientists engaged in animal research; anyone can use Google to look up what a researcher does. The sensible thing is to be proactive and prepared to defend our work. The public needs to hear all sides of the story. What we were trying to bring out in the feature is that the fringes are currently defining the debate for a huge proportion of policy makers and scientists. I’d love to get to the point where the minority who are extremists don’t have this power over the debate. […] that violent elements are few and far between. But they do so much to derail any fruitful conversation, they must be countered strongly. As soon as you introduce fear or intimidation into the debate, there’s no more room for intelligent conversation. I think that the Pro-Test group has shown how support of animal research can be done, and done well and safely. The real danger – to my mind – is keeping silent on this. 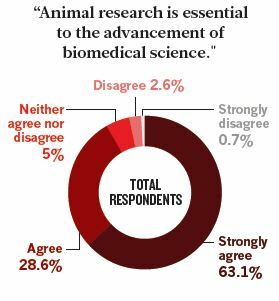 Scientists should be proud of the work they do, whether or not that involves animals. In the UK there is the perception that tougher laws have helped. One of our features from this week looks at one activist who fell foul of them (http://www.nature.com/news/2011/110223/full/470454a.html). In the US they have had some teething problems, but they do show that attacks on animal researchers will not be tolerated. We asked our researchers if there were blockers to doing more for the 3Rs. They all said “time.” They are under so many pressures to focus on commercialization. How do we MAKE the time internally or do we “outsource” through academia, consortia, or scholarships? Let’s face it, the three Rs are jargon. If we talk about the principles underlying the jargon, most scientists will recognise them. There were many more insightful comments from the variety of people who contributed, and you can read it all on Nature’s website.